Families and couples can rent a chalet, cycle down east coast road to Changi Village, eat a plate of nasi lemak (Mizzy? International?) 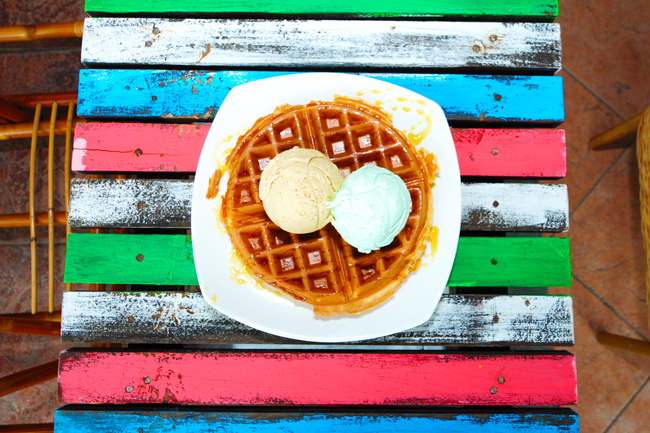 and enjoy a plate of ice cream waffle on a hot sunny day. Changi Village’s food choices are getting more diversified. Apart from nasi lemak, cafes have become a popular addition there. 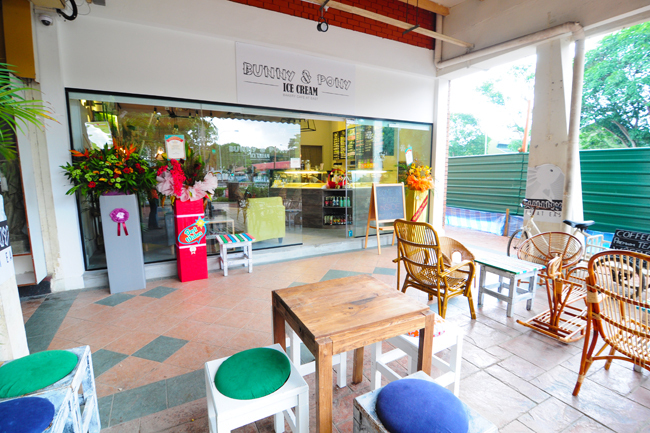 Bunny and Pony has joined Chock Full of Beans and A Spoonful of Sugar, being the newest addition to the area. Bunnies and ponies are farm animals that don’t live in the city, and that explained its rural geographical location and its name. In their words “Pony doesn’t hop and Bunny doesn’t gallop. They are the best of friends.” We are serious. There are two long tables suitable for bigger groups of families and friends. 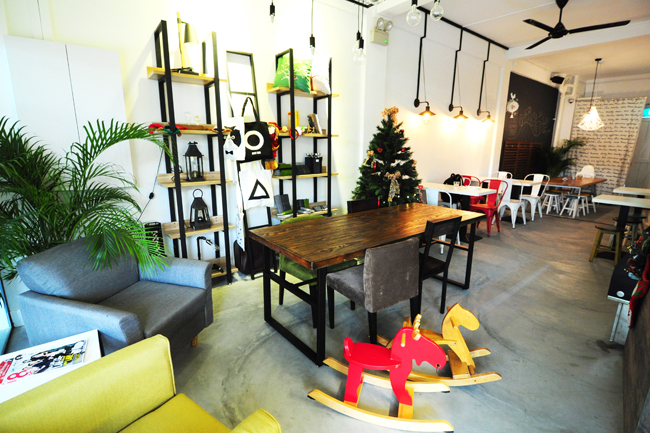 The rattan seats for their outdoors seating area had a suburban countryside feel. Take a chill pill, sit back, relax and people watch… Maybe not much since it is facing a crossroad traffic junction. Like the other ice cream cafes, they offered the usual repertoire of ice cream, waffles ($8.10 with a single scoop, $10.10 with a double scoop), coffee and cakes. 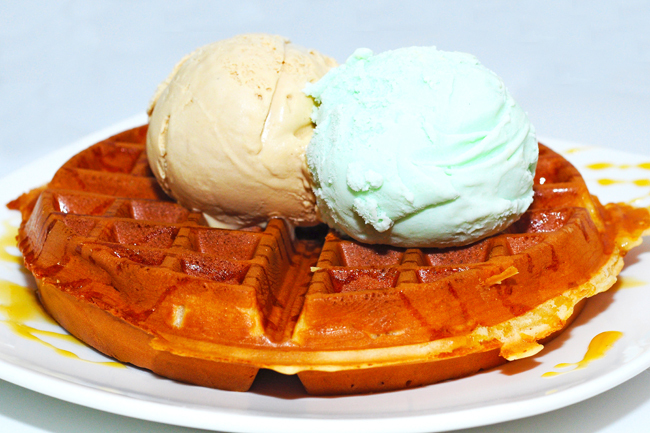 We ordered a Waffle with 2 scoops of Ice Cream – Gula melaka and Lavender ($10.10). $10.10. They had an intriguing price tagged to it and I had to search for a 10-cents coin to pay the bill as only cash was accepted at that moment. Obviously did not put the economics lesson of psychological ‘charm pricing’ to practice. The waffle had a slight crispy exterior and fluffy interior, just the way we liked it to be. The gula melaka flavour ice cream was thick and creamy with distinct palm sugar taste. It would be good to tone down the sweetness by a notch, whereas the lavender flavour had a distinct floral scent and refreshing taste. Other interesting flavours included Pina Colada, Dark Sesame and Coconut Chendol. Premium per scoop at $3.60, while a Super Premium is 50 cents extra. Lifestyle products are on sale, such as lamps, bag, mugs, pouches, notebooks. Free WIFI is available. 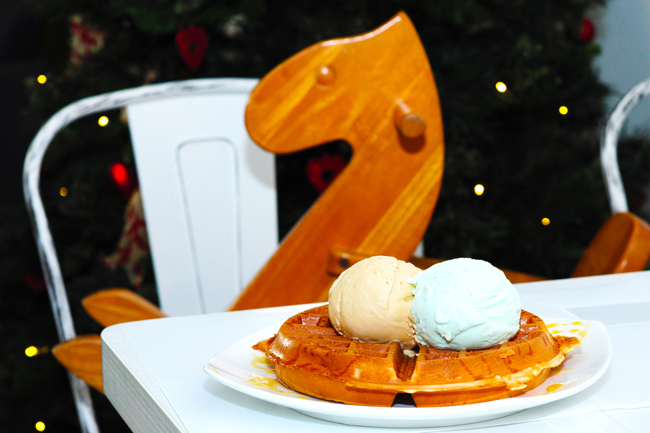 Bunny and Pony is more of a place to enjoy their ice cream and waffle. If you are up for something more filling, Changi Village Food Centre, is not too far away.